Chase Stoeger and Jennifer L. Shine in Main-Travelled Roads. Milwaukee Chamber Theatre photo by Mark Frohna. Musicals are in this fall, with Cabaret running at the Rep and Off the Wall about to launch Around the World in 80 Days. Over the weekend, Milwaukee Chamber Theater opened Main-Traveled Roads at the Broadway Theatre Center. Main-Traveled Roads weaves together characters and plot lines from three of Hamlin Garland’s stories of rural life in 1883 Wisconsin. 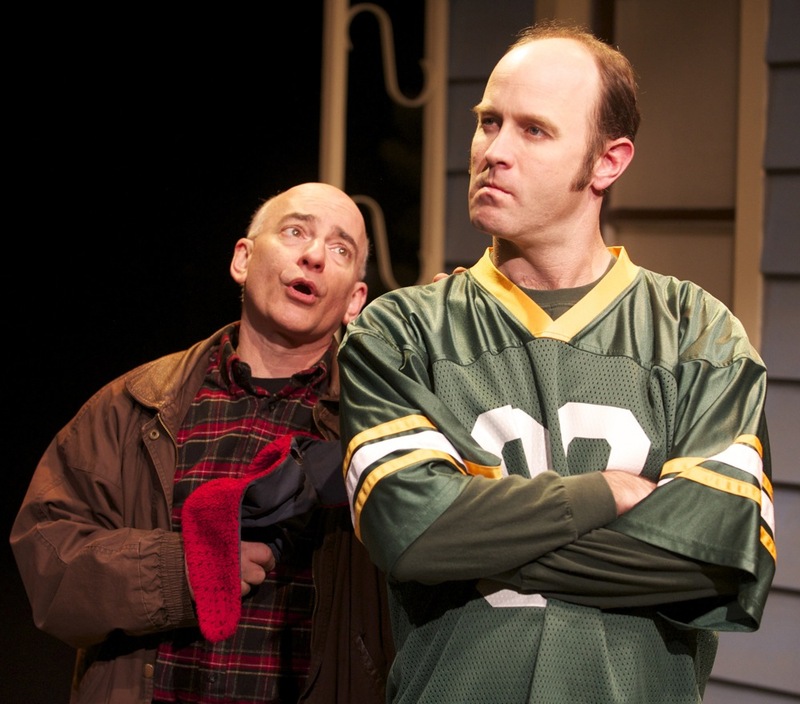 But the show’s book is clearly by Dave Hudson, with music by Paul Libman, who are known for humorous takes on Wisconsin traditions (Muskie Love, Cheeseheads — the Musical). Their sensibilities adapt a milieu of powder-milk-biscuit shyness and Victorian rules into a milieu more consistent with contemporary expectations. Hudson and Libman wrote Main-Travelled Roads for Door County’s American Folklore Theater, and it reflects that company. The show, premiered in 2007, is fast-paced, clever and fun. For the Milwaukee production, in BTC’s Cabot Theatre, Lisa Schlenker crafted an attractive unit set, with farm implements set about the stage and hung decoratively on a barn-timber proscenium. Mime transforms some set pieces; sawhorses and planks serve as both dining table and horse-drawn buggy, for example. Fences swing around to redefine indoor and outdoor space. The play features young adults on the verge of selecting their paths in love and life, in intertwined tales of love wished for, lost and rediscovered. Garland’s stories, written in 1891 and to some extent from the author’s experience, reflected the times. His characters do not kiss or speak plainly to one another, but he could put us in their minds to understand their true thinking and intentions. Hudson and Libman couldn’t do that, so their play has a more contemporary and familiar feel. Because of that, some sudden shifts in behavior are a little harder to understand on stage than in the book. Class distinctions, of “town folk,” “Yankee farmers” and “German farmers,” pervade the stories. But neither Garland nor Hudson/Libman make much political use of it. Characters know their places, but stretch their boundaries as they slowly begin to imagine the American dream. Chase Stoeger’s Will wants to break out of farming life to become a lawyer. Clare Arena Haden, as Nina, strives to exit her life as a second generation German farm girl and become a “Yankee.” Of the four actors — all cast in multiple roles — Stoeger and Haden appear most at home in the 1880s. Scott Haden settles into his serious moments nicely, but sometimes plays the comedy too broadly. Jennifer Shine brings energy, humor and sparkle to her two important roles. Her voice and style would fit nicely into any contemporary musical, but she misses Garland’s sense of a time gone by, particularly in the serious moments. Then again, this musical is not a historical drama, but casual fun and, occasionally, unabashedly corny in the way of American Folklore Theater. Everyone sings well. The songs are a mix of styles, from countrified folk tunes to anachronistic ragtime (which didn’t catch on until the 1890s) to songs that would fit any new Broadway revue. Down-home instrumentation – piano, bass, banjo, fiddle, washboard and even spoons, all played by the actors – gives the music a quaint, rural cast. On-stage pianist/music director Alissa Rhode and bassist Rich Higdon expand the company to six. They sing and even play some of the minor characters. Main-Travelled Roads does not run as deep as Hamlin Garland’s stories, but it is a lot of fun. The stories — A Branch Road, The Creamery Man and A Day’s Pleasure — are now public domain and available free online. They’re worth reading and will be especially interesting if you see the show. Milwaukee Chamber Theater will perform Main-Travelled Roads Wednesdays through Sundays through Oct. 31st at the Broadway Theatre Center. Details and links here.